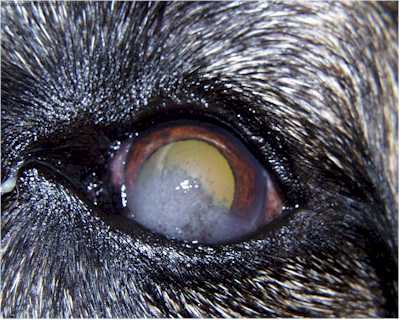 Above: Appears to be an Immune Mediated Keratitis (inflammation of the cornea requiring topical steroids to keep it controlled. 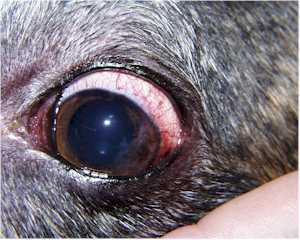 Unilateral in this dog (a greyhound) but usually a bilateral disease of German shepherds. This is not painful but potentially blinding. Above: Two-week follow up picture on the greyhound. Note how the corneal vascularization has regressed and the pigmentation of the cornea is a little less dense. 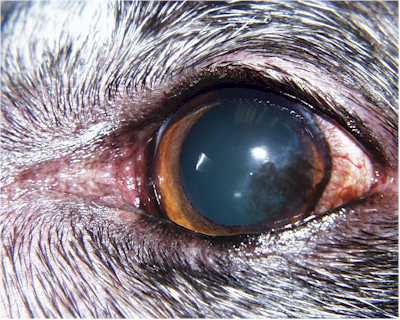 Chronic Superficial Keratitis can also affect Dachshunds and Border Collies as well as shepherd crosses. Frequent therapy is needed initially and usually can be tapered to once daily. Occasionally we have to use topical cyclosporine—trade name Optimmune from Schering Labs. Above: Here is another case of pannus. This time in a G. Shepherd. We are starting therapy with a topical antibiotic steroid and hope to be able to arrest the disease. Annajane B, Marlar, DVM, DACVO. The Animal Ophthalmology Clinic’s website provides education and resources for pet owners to be able to make the best decisions for themselves and their pets’ eye care. At the Animal Ophthalmology Clinic, we listen and understand the needs of pet owners and the goals they have for their pets. Copyright © 2019 Animal Ophthalmology Clinic | Animal Eye Specialists in Dallas, Texas. Powered by WordPress. Theme: Spacious by ThemeGrill.